Remember, every angler has his or her own way of casting, which is fine. However, why not take the things you already know and incorporate a few changes that will increase the amount of trout caught. Let us start by describing the types of casting methods used for trout. This method of casting is where you cast over the head in a vertical position. Starting with your rod placed behind your body, you would bring it over your head and in front of your body, releasing it just as the rod is forward of your body's position. The best time to use the overhead cast is when you are in open water or any place void of overhead obstacles. With this cast, you will gain the benefit of being able to cast great distances. The way in which the overhead cast is executed creates tremendous power to go through the rod. Working with the flex of the rod, you are given incredible casting range. 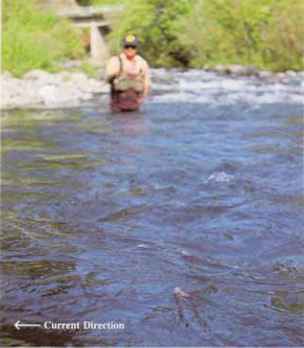 There is one drawback to overhead casting in that because this cast is done overhead, you do risk the possibility of producing rod flash as well as problems with the silhouette of the rod, both of which can spook the trout.